That's cool that you do your own hay. But it sure sounds like hard work, and I don't blame you for enjoying your time with the boys in the a/c. Very good reason to stay inside!! This does look like tough work! We drove to NY today and saw a lot of hay being gathered. 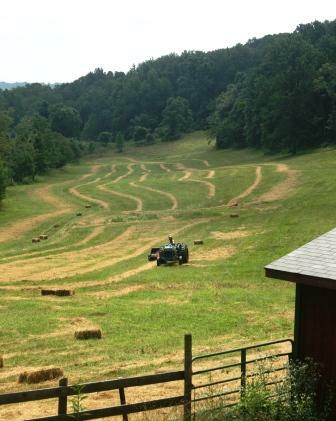 Enjoy your hay break. I remember those day, from my youth, all to well. I'm a follower now, coming over from Blogfrog. 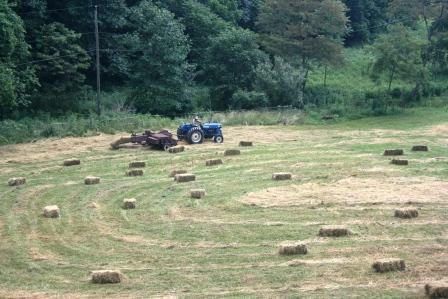 We do our own hay also but we don't do square bales any more thank goodness ! We finally round bale now. I followed you and need followers too so could you follow me too? I used to love haying! It was great fun bringing in 900 bales and filling the second story of the barn! Oh, my aching back!!! And don't forget what the twine did to your hands! Maybe that's why I have a lousy back??? ?